Why, of all groups, write about women? The answer is rooted in history. While women and men have always worked together in cigar factories, rolling galleries and executive teams were almost entirely without women until the late 1960s. 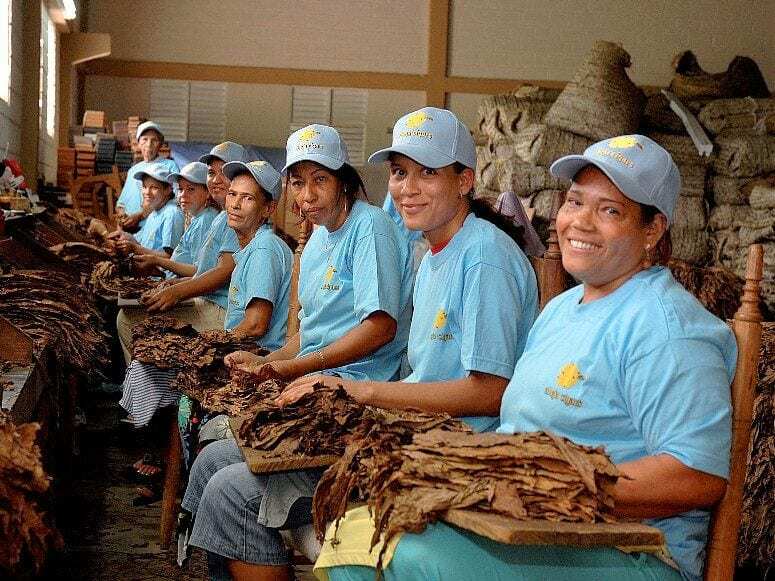 Women were first hired to work as cigar rollers about one decade after the Cuban Revolution. Celia Sanchez in Cuba led the initiative there in the late 1960s and a factory called El Laguito was founded as a rolling school for women. It continued that way for decades and most of the rollers there today are women. At the same time as exiles set up factories outside Cuba, they broke with the tradition of male rollers because women, particularly in the Dominican Republic, were the most qualified employees. Jose Seijas was the first to hire women rollers there and he was followed by the new MATASA factory two years later. But this is not an academic paper on Gender in the Workplace or some such thing. What follows are stories about some of the most exciting women in the cigar industry and what they are doing in their corners of the world. We will start with someone who, as a child, literally lived in a cigar factory. President of US Operations for A. Fuente y Cia, Cynthia Fuente, is a true product of a cigar factory. No, she is not made of tobacco leaves, but they are certainly on her mind. In Tampa, Florida, Cynthia grew up in a house where her extended family lived and worked together making cigars. Separating the family duties and company tasks is difficult for her because the family was united around the enterprise of making Fuente cigars. She recalls her mother, father, grandmother and grandfather working astride on matters of children and tobaccos. As the company evolved and production eventually settled in the Dominican Republic, members of the family spread out, and now live in both Tampa and Santiago. 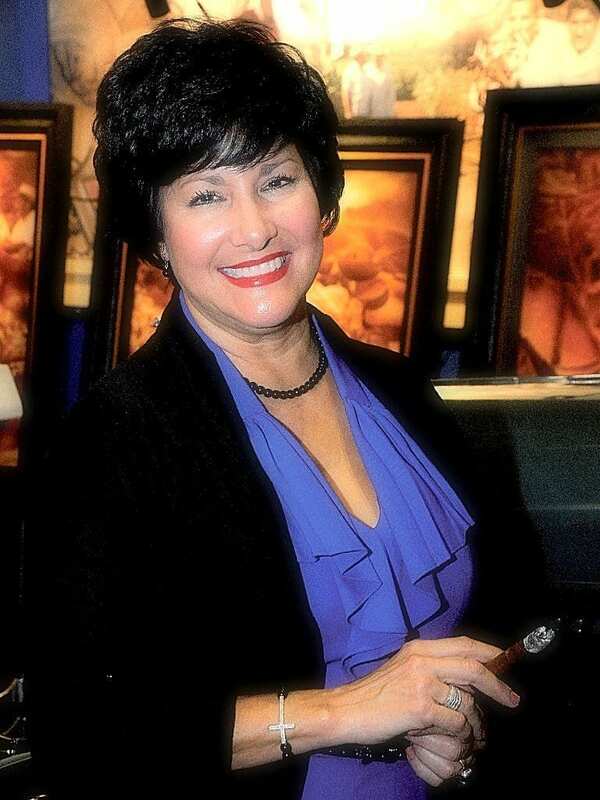 During the early years of the Cigar Family Charitable Foundation, Cynthia was a pioneer. Along with her family, she innovated and found highly effective ways to foster the community surrounding their farms in the Dominican Republic. Healthcare for the community is provided by the foundation and a tremendous number of the students go on to artistic, professional and skilled careers and to universities. Cynthia herself went to the University of South Florida where she studied Business and Psychology. After exploring several careers, she decided to move into the family business. As so often happens in family businesses, she worked in nearly every department. Now, as President of US Operations, she is in a position that she loves every day. She has a passion for people and in her current role she talks with sales teams, retailers, and smokers on a daily basis. A. Fuente y Cia is moving into its second century this year and she clearly feels that there is nowhere she would rather be than in her family business. Honduran-French Maya Selva began her odyssey in tobacco and premium cigars in 1992 when she went to Honduras to learn everything she could on the subject. Living in Paris, Maya’s first idea was to visit cigar country and return to France to distribute a brand. But this idea soon faded away as she dove into life as a cigar factory worker. She was fascinated by the artistry behind cigar making. So soon after arriving she dove into Nestor Plasencia’s factory head-first. She worked as a laborer in every department. “When I worked in each department I learned the importance of each job for quality control”, recalls Maya. Europeans are very familiar with Flor de Selva, Maya’s first brand. But even today as she remembers the first produced box of Flor de Selva you can see the emotion in her eyes. “It was made in March 1995” she recalls. And the brand, still her flagship, was Flor de Selva. “Nestor offered to roll my recipe for me” she explains. Talking about her mentor, Nestor Plasencia Sr., is clearly like talking about a parent for her. She fell in love with the tobaccos of the Jamastran Valley that Plasencia grows. They evangelized to Europe about this tobacco and use it extensively in her blends (recipes). Maya’s connection to Honduras is strong. It is part of her heritage but it also became her second home. Her connection with the people who make her cigars is familial. So it was a natural result that she should be part of the founding members of the Honduran Association of cigar makers along with the Plasencias, Eiroas, General Cigar, and Consolidated Cigar. They held the country’s first cigar festival in 2011 called Humo Jaguar and of this Maya is very proud. Her plans now include broadening the audience enjoying her cigars. “I was born in Pinar del Rio, Semi Vuelta. The town was San Diego de los Baños. It is a small town in the middle of tobacco country.” Ana Lopez did not grow up on a tobacco farm or in a cigar factory. But her father smoked cigars and her mother worked in an escogida. When she went to the University of Havana to study Economics and Foreign Trade, she would come home in the winters to work on tobacco farms collecting leaves and sewing them to hang for drying. This humble start was the beginning of an extraordinary career marketing Cuban Cigars. Upon finishing University she began working in the cause of Cuban Cigars. She started in 1984 in the purchasing department. After a while she decided that she needed to advance so she studied for her Masters degree. Then came a job in the marketing department and in 1993 Ana became the head of Marketing for Habanos where she has remained, more or less, ever since. The years since Ana took over marketing have been shockingly successful. In the late Nineties the company started to produce a now legendary event called the Festival del Habano. This showcase of products and culture is the model for festivals around the world. In cigars, the company launched Edición Limitadas, Regional Releases, Reservas and Gran Reservas, Antique Humidors, Cohiba’s Siglo VI and many other products that have withstood the winds of time. As Ana looks to the future, she sees many challenges. Smoking bans, tax increases, marketing restrictions, and the unpopularity of smoking are all on Ana’s radar and she is working with the Habanos team to confront each of these issues. La Flor Dominicana is a family business. Well, now with the kids it is. It started as a partnership between Ines Gomez who runs sales, distribution and operations in the US while her husband Litto heads production and product development. And today, the company is still run that way. 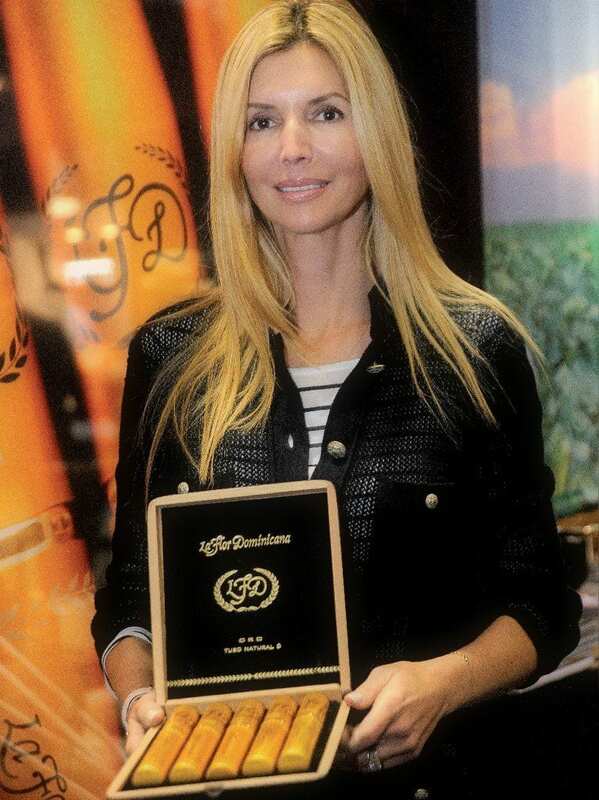 Ines works in Coral Gables, Florida, and since 1994, she and Litto have worked together to build La Flor Dominicana into an internationally recognized and respected cigar company. They have had two children since then and work every day to manage a growing family and growing business. Ines explains that early on in the company, they decided that Litto would travel to the Dominican Republic three weeks a month to manage the factory and leaf production but that he would return every weekend and stay in the US one week a month. This schedule is one of the keys to their success. Litto explains that he and Ines share mutual respect. They work to make sure that they have the same goals and then separate responsibilities. “She is my inspiration, I am always trying to impress her”, he explains. Ines works with their sales team and retailers every day. This gives her a unique view into the desires of consumers and retailers. She explains that because shelf space is limited in retail stores, they have re-designed most of their boxes so that they have a small width and retailers can fit more of their products on a shelf than they can of other brands. These refinements and insights are clearly part of what makes La Flor Dominicana such a well run company. As Ines says, her privilege and advantage is that she gets to listen to customers and spend time with them. Some daughters finish school, play around, and then find that it is convenient to join the family firm in a nice safe job while they cast their line out for a good husband. Janny sits at the opposite pole from that position. She didn’t have the option. Janny grew up in a small town, Baez, far east of Havana. She studied hard and was sent to the Cuban schools for the smarter kids. But from an early age, Janny had some element of desire to leave Cuba. So she applied for the annual lottery for exit visas. Despite poor odds, in 1996 she won a visa. The decision to move to the United States without her parents or brother was a difficult one for Janny. She left everything she knew behind. But despite the sacrifice, Janny decided to make the move. She arrived not knowing anyone. Well nobody close. But there were three distant friends in Miami who were kind enough to put her up briefly. From the USA, Janny was only able to speak with her parents once every two weeks. She did not have much money. She struggled. But after a few years Janny started to feel more stable. She was able to make enough of the right friends who could apply for visas so that her family could move to Nicaragua. They moved to Nicaragua, got visas to Mexico and walked across the border to the USA where they met Janny after 8 years apart. The family stuck together and from 2002 until today, they have been building a company together. Janny has led operations, sales, and offices in the United States. She has led the marketing machine that brought the company to international renown. Though they work together as a team, Janny is doubtlessly responsible for a great heap of the company’s success in retail stores around the world. The “next” generation of the MATASA (Quesada) family includes Patricia, Raquel, Esther, Manuel, Hostos and TJ. This group is touted by “elder” Manolo Quesada as the future of MATASA. They have great shoes to fill. MATASA has successfully sold Fonseca in the United States for decades and Manolo is one of the most respected cigar men in the industry. 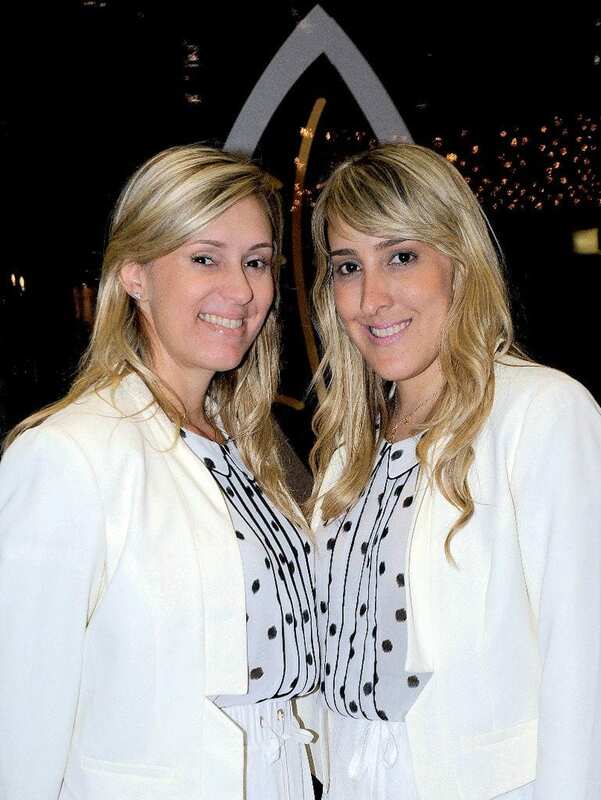 The two representatives of the company at events around the world from the new generation are Raquel and Patricia. They seem to relish the parties and are always among the most popular cigar makers at an event. But they are not mere brand ambassadors. Raquel is taking the lead at the factory for creating new blends, managing tobaccos, and ensuring that cigars are made to exactly the right recipe. This job is often called “master blender” and though she is young for the job, the successes of MATASA’s recent releases show that she handles the job … and then some. Patricia makes sure that the trains run on time. That is to say, she oversees administration. As if that is not enough, Patricia is the generation’s spokesperson. With the successful introduction of cigars bearing the Q logo, for Quesada, Patricia has guided consumers to their newer, stronger cigars as the taste portfolio has expanded. Esther Quesada runs MATASAs leaf processing and farm. When examining the areas of responsibility of each of the new generation, it begs the question, who was running things before they arrived? But the truth is that MATASA is expanding. And it is in no small part, due to the efforts of the “next generation” as Manolo likes to say. Perhaps no family is as well known and respected in the tobacco/cigar industry of the Dominican Republic as the Kelners. 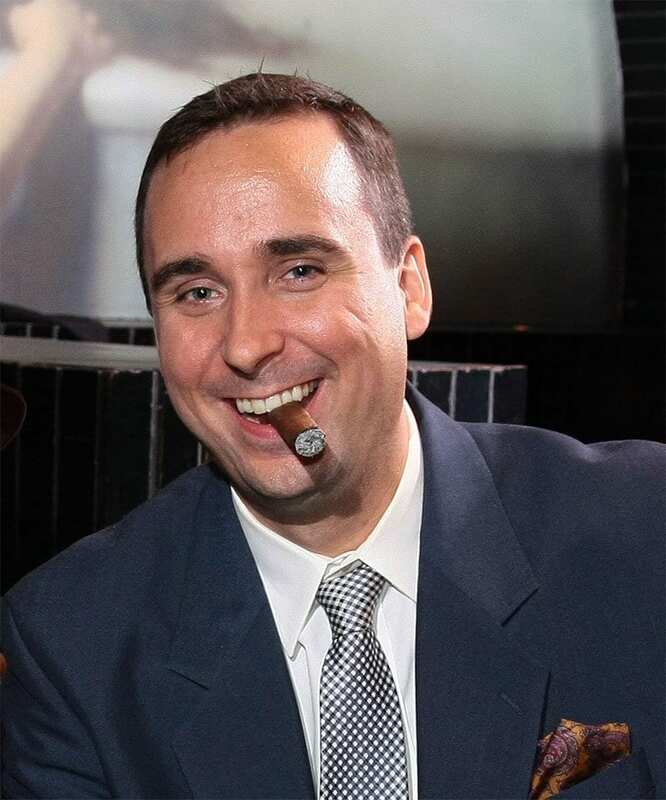 Henke Kelner is the founder of TABADOM, the maker of Davidoff and other cigars. Two children, Hendrik Jr. and Monika Kelner have gone into the business also. Monika is the owner and runs the tobacco processing company, Tobacco Leaf Sorting. The company, which she started in 2004, buys and prepares premium tobacco leaf for cigar factories. Specialists in leaf from the Dominican Republic, Tobacco Leaf Sorting now imports leaf from countries including Mexico, Indonesia, Ecuador and all around the Caribbean. If required, the leaf is then fermented in their facilities so that it is ready to be used. It is then classified by type, size, color and then sold to factories ready to use the leaf in production of premium cigars. Last year, Monika began an exciting expansion. She is now growing wrapper grade tobacco in an area of the Dominican Republic called Cotui. The seeds used are Criollo 98. She explains that the leaves from Cotui are elastic, oily, and have a reddish hue perfect for clients seeking a super premium and rare wrapper leaf. Abeja Cigars is not a household name, but many of the brands it makes are well known. The factory has produced Heavenly cigars for eight years, Scarface for six and started making cigars for the retail powerhouse Thompson one year ago. 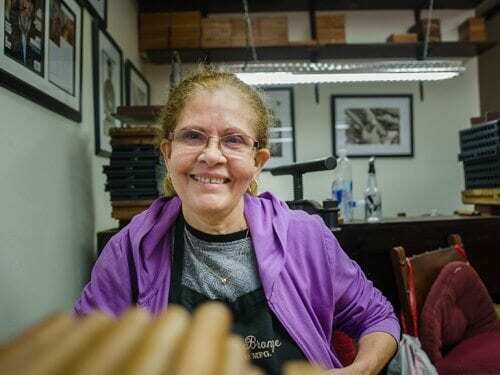 Bienvenida Ovalles is the only person in this feature who owns and operates her own cigar factory. 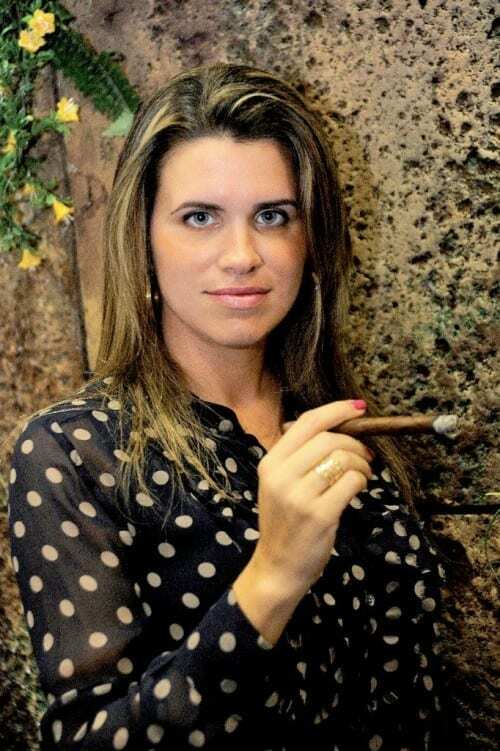 She comes from a family of cigar and tobacco industry insiders but Abeja Cigars is her world. 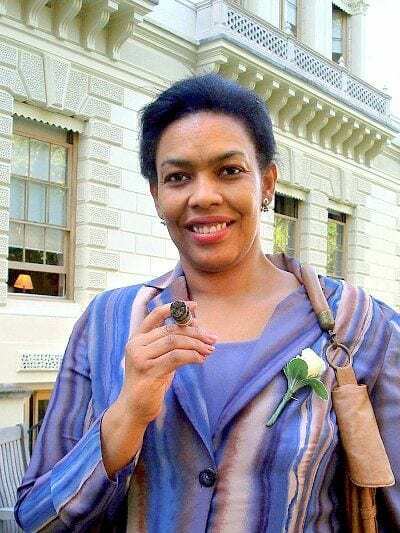 She started the factory with a contract to make Cojimar cigars in 1997. Since then the factory has been humming along with orders of millions of cigars. During the factory’s life, Bienvenida has turned it into one of the most open, welcoming, and beautiful factories in Santiago. Staff can eat and meet in large covered outdoor spaces. A blue and yellow theme runs through all the tile, paint and decor around the energetically colored factory. Bienvenida is very proud of how she has used a “woman’s touch” in setting the tone around the factory. Now that Abeja is growing filler and binder in Canca (Tamboril), Bienvenida is looking to the future with her own private supply of tobaccos. La Palina, as a brand, is uniquely named for Goldie Paley, the matriarch of recent generations of Paleys. Today, the company is operated by a team consisting of Bill Paley and Courtney Smith. Their limited release cigars are made by Sandy Cobas and rolled by Maria Sierra in Miami. Their recent release, the Goldie, was a limited edition cigar made to the specifications of the Laguito #2 size. The hand-crafted expertise is provided by Maria Sierra who was one of the very first women in Cuba to be trained as a cigar roller. La Palina is a great example of how the cigar industry has changed in the past fifty years. It shows that women in executive roles, management, and all levels of production are innovating and pushing the cigar industry to greater heights. 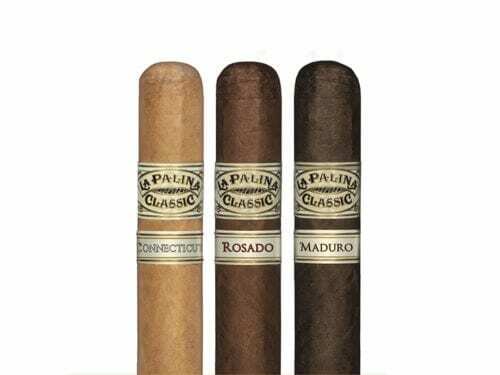 La Palina Rolls Out New Classic Lines in the U.S.A.